This past weekend I had a teacher's outing for the first semester. We boarded the bus at 13:30 on Friday, and headed southeast to Andong, Korea. Hours later, our first stop was the Andong Hahoe Folk Village. The village is famous for its traditional houses, and all of the historic scholars that were born here. The village is surrounded by the Nakdong River, which flows in a unique S shape at this particular point. The Hahoe Folk Village became a UNESCO World Heritage site in 2010. This forest was really beautiful as well. The sun beat down strongly, but my amazing co-teacher had brought along an extra visor, which she lent to me whenever we were outdoors. I rocked the typically-huge Korean female visor all weekend! 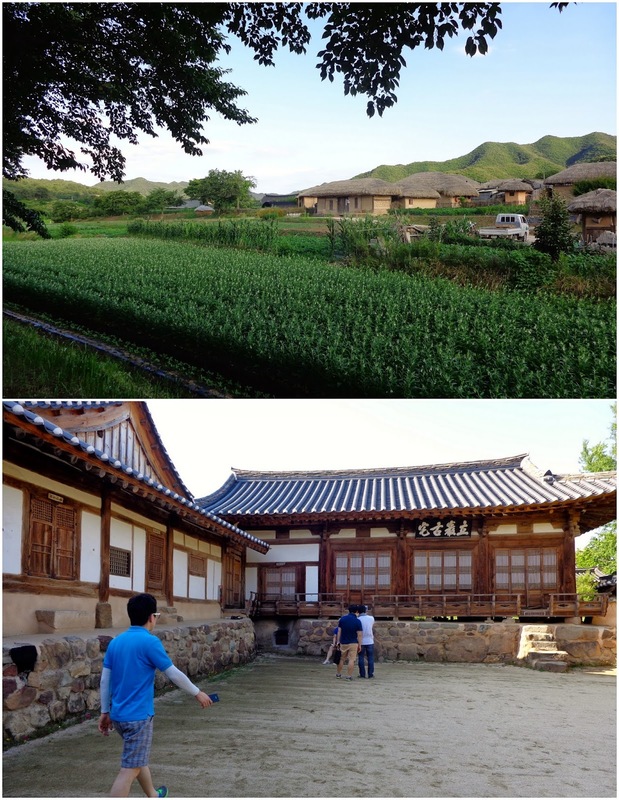 The houses in the village either had straw roofs from the rice fields, or traditional Korean roofs. From the village we had a half hour or so bus ride to our lodging in the mountains. It was a curvy ride, and I was sure I could have hurled if you'd put a bag in front of me. I focused on breathing and not puking, though later discovered many others felt nauseous as well. The surroundings were gorgeous, out seemingly in the middle of nowhere. I was in a "room" with four other teachers, but not my co-teacher. 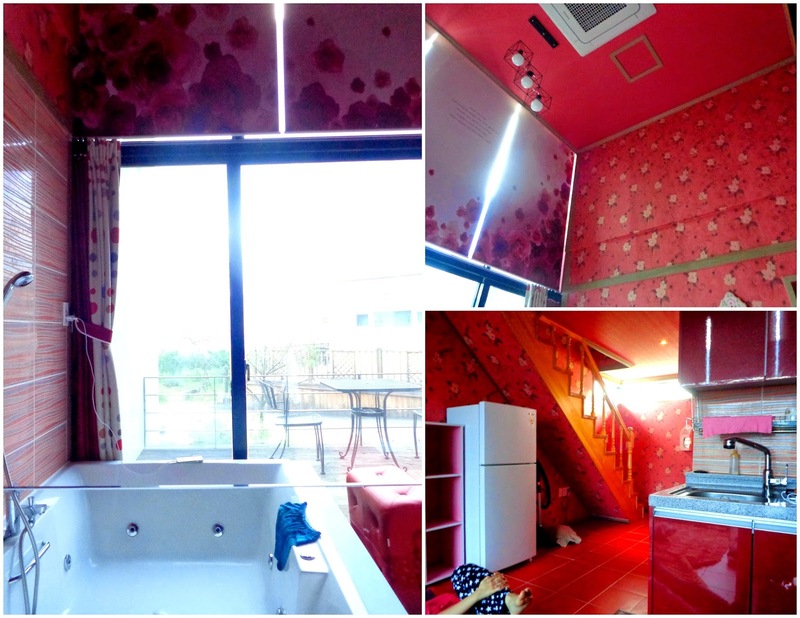 The place was horribly yet hilariously decorated in various shades of pink and red. Right when you walked in there was a hot tub in the middle of the living room, right against the windows. I walked up the stairs to the loft to discover one bed next to a red heart-shaped shaggy rug. Classy. We were in a lover's getaway suite. And we were five. I'd assumed we'd be having dinner at a restaurant somewhere, but turns out we'd brought ingredients and food along with us to cook ourselves. There was a big covered area with plastic windows looking out over the mountains where we ate on picnic tables; felt like we were camping. There was one side dish on the tables that I hadn't heard of nor tried before. 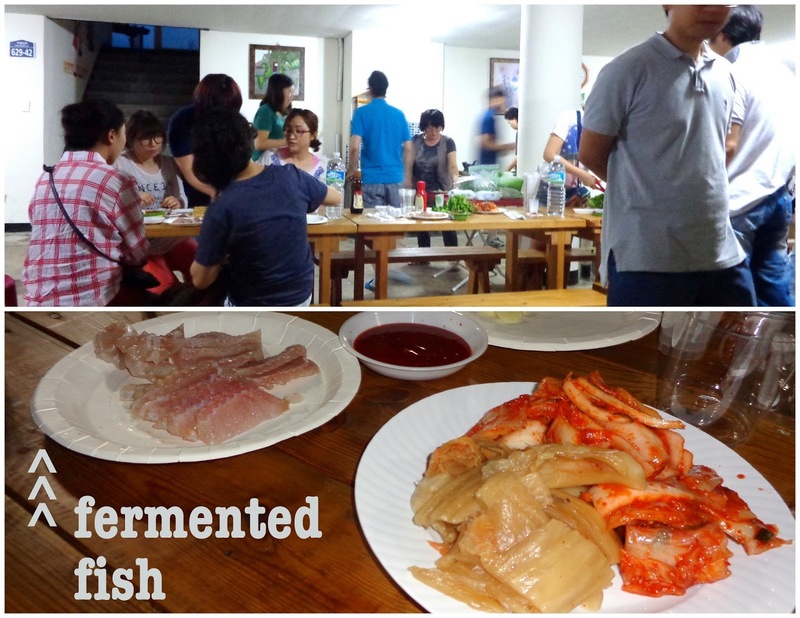 It's called Hong-eo, and it's fermented fish. It's known for smelling like ammonia, and oh boy did it ever. So I tried a piece, putting it between two pieces of kimchi like my co-teacher showed me. The smell got worse when it was up in your mouth, and while the taste wasn't anything overly terrible, it was so chewy. Especially down the middle. I wondered what exactly I was chomping on... I kept chewing and chewing and chewing. I swallowed parts from the outside, but man that spinal cord or whatever it was down the middle was giving me problems. I looked around for a napkin to get rid of the hard remains. None in sight. The piece was too big to swallow in one go, but I could not separate it for the life of me, despite all my chewing. Then I remembered I still had a small piece of tissue in my pocket from lunch. Ta-da! I ate and ate, and the soju heavily flowed, as it would at any Korean work dinner. This meant a few teachers had courage to try talking with me in English, which gave my co-teachers a rest from trying to entertain me. It wasn't until a bit after midnight that I headed in to the suite. The other teachers were sitting on the living room floor talking with each other (in Korean, obviously). One told me to go upstairs and sleep in the bed; the four of them would sleep on the floor. This is what I had feared would happen. Two could have definitely shared the bed, and I didn't want to be the reason why all four slept on the floor. If it were earlier in the night, I might have tried to say otherwise, but given the hour, my exhaustion, the difficulties of communicating with non-English speakers, the pain I would save my fused spine, and the knowledge that Koreans are much more used to eating and sleeping on the floor than Americans, I decided to just call it a win and went to bed up in the loft.